Overview Students need to know what Cloud Computing really means, how it fits into the wider computing context, and how they can use an open source cloud alternative to quickly host coding platforms for them to toy around in. This activity sets out to do all of this as a walkthrough learn-as-you-go tutorial via Red Hats Open Shift platform - a completely open sourced cloud-hosted coding platform. Students need to know what Cloud Computing really means, how it fits into the wider computing context, and what the different types are (IaaS, PaaS, SaaS). Students can dig into PasS, as a powerful development platform - and understand how quickly, easily, and powerfully they can spin up new applications. Gone are the days of having to setup a physical server, know the details on how to setup the OS, fiddle with the kernel, setup web-servers (Apache), databases (Postgres, Mysql), and middle-ware micros-services (AMQP Message busses, JBoss Fuse, Apache Camel). In a PaaS environment like OpenShift, the developer just fires up an instance of whatever pieces they want, and start coding. Seriously - its that easy. Of course, the developer has to know how to develop in said language or platform, but it makes development considerably easier by removing focus from lower layers. Basically, those lower layers (most mentioned above) are automated away by the PaaS platform. This activity shows students, step-by-visual-step, how to start up a new coding environment and actually implement a small chunk of working software on Openshift. You may have heard of Software as a Service (SaaS), or Cloud Computing before. Examples of SaaS are that of Google Docs, Twitter, DropBox. Another flavor of Cloud Computing is Platform as a Service (PaaS). This cloud-hosted service allows developers to program apps and functionality in an easy to grasp, scale, and demo online environment. You can push stuff live very quickly, and you don't have to worry about the Operating System or getting database services running. Your infrastructure and coding platform are pre-taken-care-of. You just code your app. 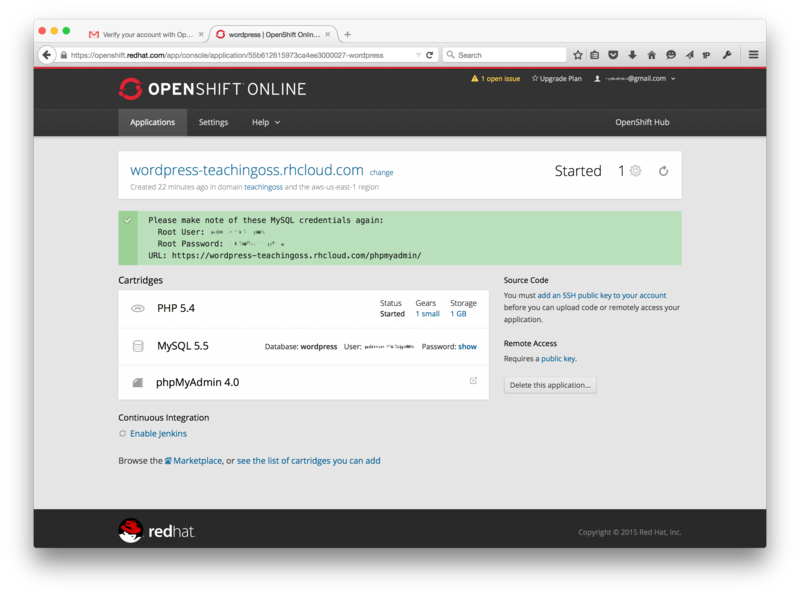 In the below tutorial, you will signup to the Openshift PaaS environment and start a simple Wordpress blog app. Assure that you read the Background readings, so that you understand the Cloud Computing paradigm and what a Paas is. Likely, you will not need to follow Step 2B, though skim through it for some additional understanding of the OpenShift structure. Likely, you will not need to read or follow Steps 3, 3A or 3B - unless you have interest in using an existing domain name that you own. What other apps and coding platforms / languages could you use? What should the instructor know before using this activity? Instructor should understand what Cloud Computing is; If not, the pre-readings are necessary for the instructor. It would be useful for instrcutor to step through the instructions and create an app themselves. What are some likely difficulties that an instructor may encounter using this activity? Grading the activity may be subjective and not reflective of student effort since much of the effort goes into implementing the Wordpress app, but then they are graded on the blog they post that recaps what they did. Has the mentor ever programmed in a web or cloud computing environment of any kind? Share your experience and knowledge with the students. Help students through troubleshooting and the last blog question: What else might PaaS platforms be used for? What kind of coding languages and apps might you use it to develop?